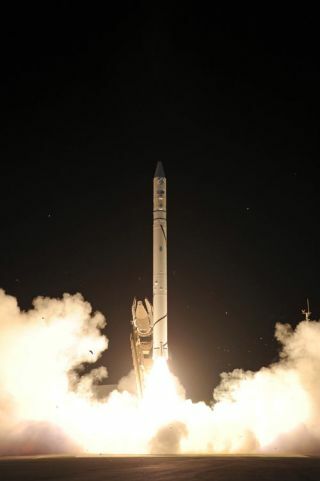 An Israeli Shavit rocket launches the new Ofeq-9 spy satellite into orbit on June 22, 2010. TELAVIV, Israel - Israel successfully delivered its latest spy satellite into lowEarth orbit Tuesday using an improved version of its indigenous Shavitlauncher, defense sources here said. Anofficial Ministry of Defense (MoD) notice of launch, which took place around 10 p.m. local time, is expected by midnight,once technicians ascertain initial functioning of the Ofeq-9 imaging satellite.By June 25, officials say they should be able to validate the operationalcapability of the 300-kilogram satellite and its subsystems and begin receivingthe first pictures from its high-resolution sensor. "Wedelivered it perfectly, but we're still waiting to hear the baby's screams,"said Chaim Eshed, director for space programs at Israel's MoD. Ofeq-9is a "twin brother" of the Shavit-launched Ofeq-7 and Ofeq-5satellites, the former operational since June 2007 and the latter since June2002. A September 2004 launch failure destroyed Ofeq-6, while TecSAR, Israel's synthetic aperture radar satellite, was successfully launched by an Indian rocket inJanuary 2008 and now occupies the Ofeq-8 slot in the Israeli MoD lineup. Asof 11 p.m., officials here were waiting for the Ofeq-9 to make its first passover Israel. "Right now, it's giving a pulse, and we assume it has openedits solar panels, but our inspection and validation must wait for it to passover Israel," a program official here said. "Right now, all I can sayis the injection was very nominal and very precise. The first stage, secondstage, and third stage, as well as the separation of the satellite from thelauncher, performed as planned." Ofeq-9will operate together with the two other Ofeqs currently in orbit, and while precise imaging capabilities remain classified, sources here say all three offerresolutions "much better than" a half-meter. IsraelAerospace Industries Ltd. is prime contractor for the Ofeq satellitesand the Shavit launcher, while Elbit Systems' Elop produces the high-resolutionimaging camera.